Let’s be honest with each other, Internet stranger. I’ve never played an NHL game before. My sports-gaming experiences come from throwing balls, not hitting pucks. And I’m going to go ahead and admit it--the deep and insatiable wrath of the Internet concerns me a little. I just finished trying out NHL 14, and I’m pleased (and extremely relieved) to say that not only did I like it, I enjoyed it more than any other sports game released in a good, long while. In order to prevent this review from devolving into a lengthy compare and contrast between EA Sports NHL and other sports series, I want to take a sentence to get a thought out of my system: NHL 14’s fast-paced gameplay vibrates with an energy lacking in other sports titles. The action never stops. Players jet in and out of the game, teams steal the puck by knocking an opponent off their feat, and pissed-off men throw off their gloves and engage in honest-to-God fisticuffs. 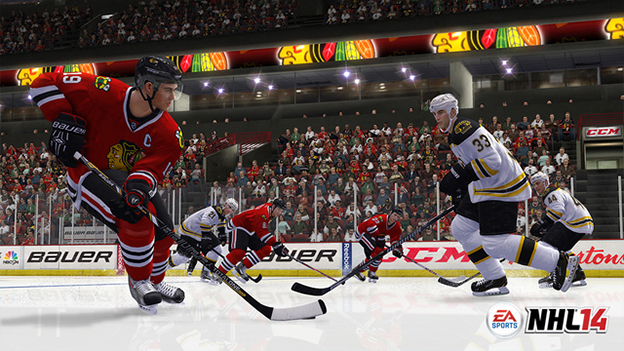 The games in NHL 14 never stop moving, and even the most easily distracted gamer will find it difficult to look away. Easy-to-grasp skating mechanics are the cornerstones of NHL 14’s energy. Players cut, check, spin, and turn without ever ignoring the laws of physics that govern skating on ice. These laws create a unique way of moving, and movement never ceases in the hockey rink. Stopping takes patience, as players have to glide to a halt, and the hockey puck constantly propels from one side of the rink to the other with players chasing behind it. Stopping while controlling the puck slows down the game’s pace, but only for a moment, because standing still for too long will get a player bulldozed. Each game of NHL presents players many opportunities to hit each other. Making a wrong turn, finishing up a pass, being too close to the wall, or just generally skating too slowly exposes them to brutal slams. NHL 14 really wants you to use violence. So much so that it makes the standard hit-stick employed by games such as Madden redundant, simply gliding into an exposed player initiates a hit. The potential for any play to result in a turnover caused by assault creates a tense and enjoyable atmosphere. And if this violence doesn’t satisfy you, you can initiate a one-on-one brawl with the push of a button. 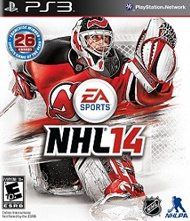 Thanks to what EA calls the Enforcer Engine, fighting in NHL 14 has enough depth to be called a mini-game. By pressing triangle, you can instigate or accept a fight. Although the computer occasionally declines, more often than not, it’ll be ready for a brawl. During the fight, you can push, pull, punch, block, dodge, and grab. These fights add another layer of intensity to the game, increasing the energy. And since these fights are mostly optional, people not in the mood for a brawl can enjoy their hockey game punch-free; well, unless someone on the other team just gets really annoyed and charges you, but that doesn’t happen too often. Enough depth of gameplay exists that the Enforcer Mode acts as nothing but icing on the cake. This depth comes from the intricate controls. 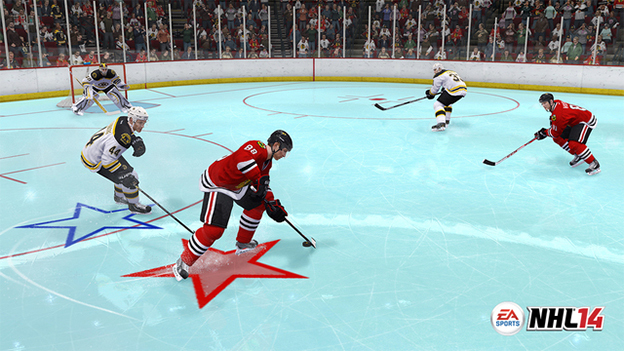 Learning the intricacies of skating and puck management will take some time, as can be confirmed by a quick look at the in-game manual, which splits the controls up into seven different situations. Offence, defense, faceoffs, coach controls, fighting, net battles, celebrations, and using the goalie all have different control schemes. Mastering NHL 14 won’t be easy. For players looking to play a hockey game from a simpler time, they can start up the NHL 94 Anniversary Mode. NHL 94 Anniversary Mode simplifies the control scheme so that it mimics the controls of NHL ‘94. This simpler mode, although enjoyable, lacks the depth of the main title. Fans of the old school, arcade-style hockey games should love it, though. NHL 14 offers many different ways to enjoy the game besides the regular game and Anniversary Mode. Live the Life Mode lets gamers simulate (more or less) what it’s like to be a hockey player. In this RPG-esque mode, you’ll gain experience points, answer interview questions, get endorsement deals, and manage the affection of friends, family, and coaches. Although extremely enjoyable, the repetitive routine and the long seasons start to wear after awhile.